In what should probably surprise no one who has been following the Proposition 37 issue, a California proposal that would require the ingredients in all GM foods to be labeled, the so-called “Big 6″ pesticide corporations have become the movement’s main opponents. Filings released this week by the California Secretary of State’s office denote that the world’s six largest pesticide corporations have become the six biggest contributors to opponents of Prop 37. In all, they have funneled in excess of $20 million to oppose the measure which, again, would require what should already be happening: the labeling of genetically engineered or modified food. The money has especially funded an aggressive, extensive ad campaign in recent weeks. The Big 6 – Monsanto, BASF, Bayer, Dow, DuPont and Syngenta – far and away dominate the global seed and pesticide markets; they are actively opposing Prop 37. In filings released recently, each of the corporations “made contributions of at least $2 million, with Monsanto’s contribution alone totaling more than $7 million,” said PAN, in a press release. What do the Big 6 have to hide? The opposition really wants Prop. 37 defeated. Including Big 6 donations, so far those committed to defeating it have ponied up in excess of $37 million; they’ve spent $19 million with Sacramento public relations firms and on aggressive television advertising and paid mailings to voters. But why? Why are companies so opposed to openness and honesty when it comes to allowing consumers the right to know what’s in the GM foods they are buying? The answer may lie in a comprehensive study released a week ago. According to Dr. Charles Benbrook, who conducted the study using federal government data, the Big 6 likely don’t want you to know that genetically engineered crops drive up the use of dangerous pesticides while they open more markets for them as well (as usual, “follow the money”). Benbrook found that GM crops have “increased pesticide use by over 400 million pounds in the United States over the past fifteen years,” said the PAN statement. “Increased pesticide use has led to greater and greater weed resistance. In turn, this has led to more applications of pesticides – as well as use of more hazardous pesticides – in agricultural fields, putting rural communities and farm workers at the greatest risk of harm due to pesticide exposure,” the activist organization said. In addition to the use of more pesticides, the control over seeds has also benefited these giant biotech companies – at the expense, of course, of consumers. “The Big 6 chemical and seed companies are working diligently to monopolize the food system at the expense of consumers, farmers and smaller seed companies,” said Philip H. Howard, an associate professor at Michigan State University and an expert on industry consolidation. In all, Monsanto alone controls 23 percent of the world’s seed market, while Bayer controls 20 percent of the global pesticide market. So what’s the big deal, really? Why should GM foods be labeled anyhow? Probably the biggest reason why is because GMOs – genetically modified organisms – in general were not created by food or agriculture companies. 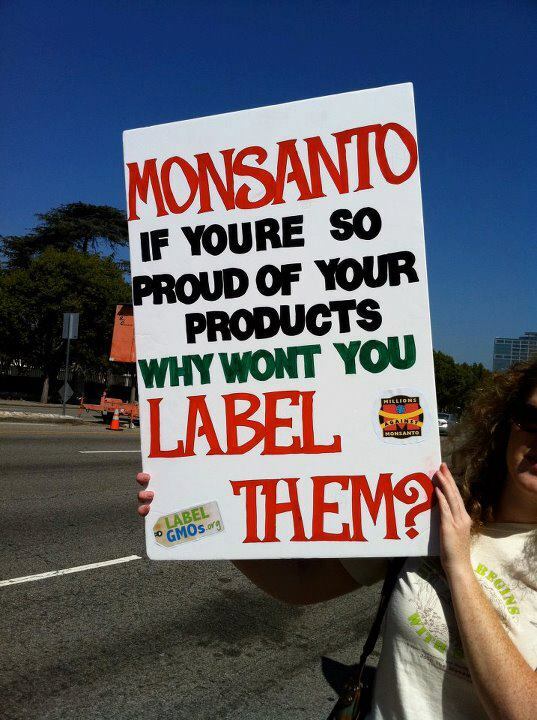 They were created by Monsanto – the same biotech and chemical company that brought us DDT, PCBs and Agent Orange. Monsanto also marketed aspartame and created bovine growth hormone (rBGH) to infect milking cows that put pus into commercial milk. That’s what the big deal is.